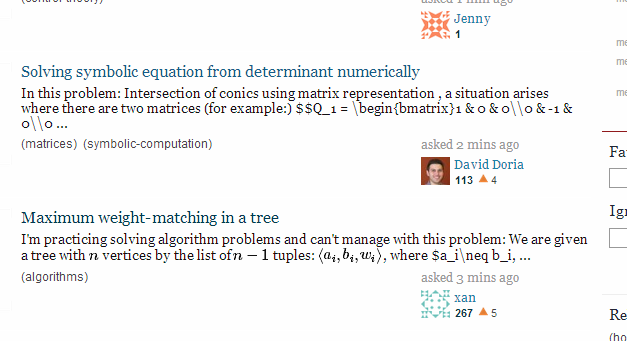 In the last days, I always needed to refresh the page after I clicked on something like 1 new answer, or this post was edited, else mathjax didn't render the $\LaTeX$ code. About 2 weeks ago, when I started using SE it always rendered without loading the page again. I use Google Chrome and I have windows 8, in the comments one mentioned the same problems on vista with firefox. The issue of posts loaded via the real-time notifications (edits, new answers, etc) now been rectified and will go out in the next deploy. I have not yet looked at the issue relating to truncated descriptions (that image wasn't there at the time). Not an answer, but a reply to 5pm's request for a screenshot. The precise steps involved me opening a new question, waiting for an answer to appear, and clicking on the "A new answer is available, click to load" button. It's not the best example I suppose but the Mathjax is clearly unformatted. The question was this one.